We manufacture tanks for safe storage of propane-butane in overground and underground versions, with capacities from 500 to 125.000 liters. Our tanks are manufactured according to the German standard Merkblatt AD-2000, are certified under the European Pressure Equipment Directive 2014/68/EU (modules B and D), and are CE marked. 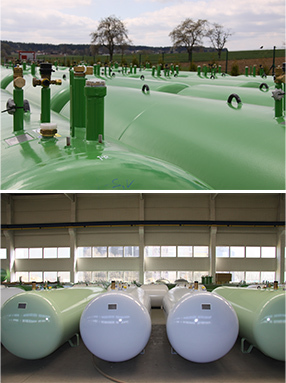 LPG storage tanks can be used in domestic, commercial or industrial sector, in autogas filling stations or at storage terminals of gas companies. Tanks are mounted with REGO / SRG / OMECA valves. An alternative solution is a multi-purpose valve – multivalve (REGO / OMECA). We produce standard tanks in horizontal design or on demand also in vertical design. On demand we offer a 100% radiographic control of all welds using the latest digital X-ray technology, available at our company.